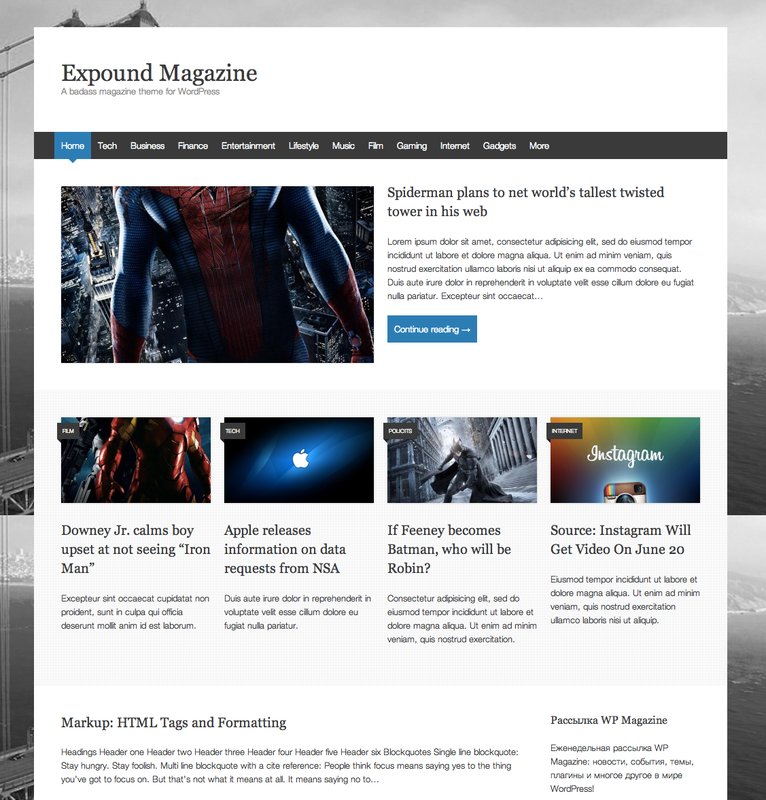 Meet Expound — a free magazine theme for WordPress. Freshly baked, straight out of the oven, filled with _s goodness, a responsive layout, wicked support for featured posts and more! You can get Expound from the WordPress.org repository, and don’t hesitate to give a thumbs up if you like it. Enjoy! Posted on June 25, 2013 by Konstantin Kovshenin. This entry was tagged themes, WordPress. Bookmark the permalink. I really like the nav menu for small screens you’re using. Is that it part of the _s layout, or something you added? Jeff, thanks! _s changes the classes based on width and provides tho onclick handler to open and close the mobile menu. I just added some styles on top of that. Looks great! Is there a proper demo site as the wordpress.org preview doesn’t do it justice! I’m not sure if you got my last comment (JetPack Comments was acting funny), but I wanted to mention that I absolutely love this theme. What I love most about it is all the features that it *doesn’t* have. It’s so hard to find pleasant themes that aren’t also bloated crap, so kudos. Thanks for the kind words Shane! Yeah, Jetpack’s been acting a little strange here lately. Love the theme, can easily be used for building child themes Good work brotha! Замечательная тема. Однако есть пара вопросов\предложений. На главной странице, чтобы записи выводились в таком эффектном виде (широкая запись наверху, и 4 записи в строку) нужно их прилеплять. Но допустим хочется чтобы на главной странице в таком формате просто выводились все последние записи? Чтобы пользователь, заходя на главную сразу видел последние представленные статьи в выгодном формате. Можно конечно вручную каждый раз прилеплять последние 5 записей, а потом отлеплять, но это неудобно. Т.е. я предлагаю сделать как опцию возможность вывода последних статей из всех (или отмеченных) рубрик в таком формате на главной: 1 широкая наверху, 4 в строку, остальные в столбик как обычно в блоговом формате. И второе – рубрика в главном меню имеет синий фон для статей этой рубрики, но для записей, которые опубликованы в подрубриках этой рубрики, рубрика уже не подсвечивается. Look really good! Naturally I’ll dig to code more closely and find some tips and tricks. Thanks for your comment Sami! I have activated the theme but i still cannot see it when i view site. how do i enable the home page to be seen? Hi Benn. To have some posts featured on the home page you have to mark them as sticky. Also, since version 1.4, your latest posts will automatically be used as featured, if no sticky posts were defined. Hope that helps! how do you set up the featured post page like in the screen shot? Just set your featured posts to sticky. How did you get am image in the header? You can put an image in the header with CSS. Take a look at this thread for more info. Awesome theme, remind me of Unique theme by Justin Tadlock. Hello, I love the updates you have done to your theme. There were a few problems I ran into. For some reason on my website towards the bottom it says ‘ Nothing Found. ready to publish your first post? Get started here’. I have published multiple posts already and even when I create new ones from the link provided that message does not go away… any idea why? Maybe I am doing something wrong? Any help is greatly appreciated.. Thanks again. Not sure about the Jetpack issue, but the “nothing found” message is indeed a bug. It’ll go away as soon as you have at least 6 posts, but I’ll fix that in the next theme update. Thanks for flagging it!